Galerie Louise Leiris, Paris (no. 011704). Galerie Beyeler, Basel (no. 4777). Anonymous sale, Sotheby's, London, 30 March 1982, lot 44. Anonymous sale, Sotheby's, London, 20 March 1996, lot 67. Anonymous sale, Sotheby's, New York, 4 May 2005, lot 330. C. Zervos, Pablo Picasso, Oeuvres de 1965 à 1967, vol. XXV, Paris, 1972, no. 63, p. 164 (illustrated p. 37). The Picasso Project (ed. ), Picasso's, Paintings, Watercolors, Drawings and Sculpture, A comprehensive illustrated catalogue 1885-1973: The Sixties II. 1964-1967, San Francisco, 2002, no. 65-063 (illustrated p. 165). Basel, Galerie Beyeler, Picasso: Werke von 1932-1965, February - April 1967, no. 59 (illustrated, and illustrated again on the back cover). Rotterdam, Kunsthall, Picasso; Artist of the Century, March - July 1999 (illustrated on the backcover). 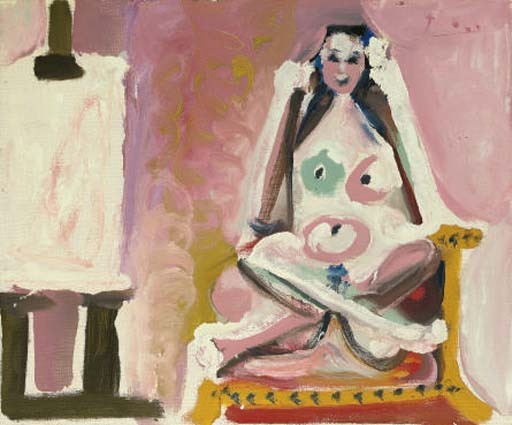 Painted in 1965 at Picasso's villa Notre-Dame-de-Vie in Mougins, Modèle dans l'atelier shows a naked woman cross-legged, facing the viewer, while an easel stands at the left of the work. On the easel is a canvas, upon which are the faint traces and outlines of a painting. Although the artist is not shown in the scene, his presence is clearly implied. Modèle dans l'atelier appears in this sense to belong to the series of pictures of the artist and his model that Picasso created during the first months of 1965. While of course it was a theme that had recurred in his work for many years, during these months the subject appears to have exerted some fascination on the artist, clearly reflecting some personal preoccupation. Modèle dans l'atelier reflects a sense of contentedness and sensuality in the artist's own domestic situation the picture is vigorously worked with bold colours, making it appear as a celebration of Picasso's own happiness. While the theme of the artist's model appeared in many of his works from this time, and while the woman in the work is almost certainly a representation of his wife and last Muse Jacqueline, he in fact seldom painted her from life, meaning that this is to some degree a whimsical scene from the artist's imagination, the image of the perfect studio, celebrating also an almost mythical and, in this case, fictitious image of the artist and his workings. For Picasso, painting was almost as natural-- and as necessary-- as breathing, and while his works channel his thoughts, emotions and anxieties through a visual code, he did not need the scene before him. As he explained to Françoise Gilot, 'I paint the same way some people write their autobiography' (Pablo Picasso, quoted in J. Richardson, 'L'Epoque Jacqueline,' pp. 17-48, in Late Picasso: Paintings, sculpture, drawings, prints 1953-1972, exh. cat., London & Paris, 1988, p. 28). 'Whenever I see you, my first impulse is to... offer you a cigarette, even though I know that neither of us smokes any longer. Age has forced us to give it up, but the desire remains. It's the same with making love. We don't do it any more but the desire is still with us!' (Pablo Picasso, quoted in ibid., p. 29).